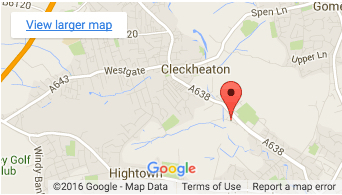 from the M62: Leave M62 at Junction 26, signpost A638 Cleckheaton/Dewsbury. Travel about 1 mile to Cleckheaton town centre, through the pelican crossing (Yorkshire Bank on left and Obediah Brooke’s Pub on right). Approach traffic lights, keep to left, and continue straight ahead, passing the bus station on your right. Travel about half a mile and when the road splits and the grass in the central reservation starts (ex dual carriageway) you will see Burnhills Feeds on right, (follow sign for Princess Mary Running Track) take lane for right turn into Primrose Lane and immediately right again to Cartwright Street you will see Magdens and PJ’s gym and Sontex are just on the right. Travelling from Leeds/Huddersfield – A62 to A638 Cleckheaton turning, travel approx 3/4 mile passing Swimming Pool/fitness complex, then take next left (signed Princess Mary Running Track) Primrose Lane, then immediately right into Cartwright Street you will see Magdens and PJ’s gym and Sontex are just on the right.